Antimicrobial Coatings Market size was worth over USD 2 billion revenue in 2015 with forecast to grow over 10% CAGR up to 2024. 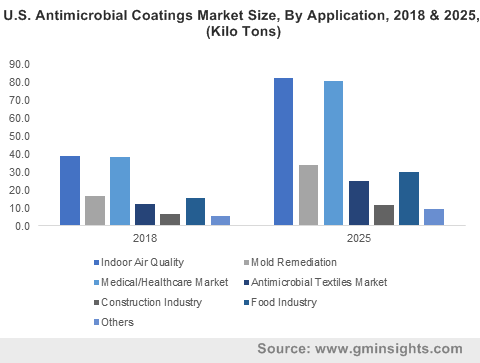 Rising consumer health consciousness and preference for the well sterilized medical equipment usage to avoid infection risk from several microorganisms has positively influenced antimicrobial coatings market growth. The industry observed a significant product development globally in healthcare industry to reduce infection incidences. Upsurge in healthcare industry coupled with increasing applications scope will drive antimicrobial coatings market growth. The medical application is among the key revenue generating segment owing to rising demand for surface treatment on medical device, which has fueled the overall industry growth. Increasing demand from residential and commercial construction projects to minimize indoor air pollution will facilitate industry growth. Preserving indoor air quality for prolonged duration is among the key property to enhance product penetration in this segment. Food & beverages industry expansion, particularly in the U.S., Germany, UK, and China will support industry growth. Stringent regulations along with need to enhance product shelf life and prevention during transportation were key driving factors. Increasing food packaging application scope in functional additive and barrier film industry will open new opportunities for the antimicrobial coatings market growth. Food packaging already accounted for over 60% of the overall functional additive and barrier film industry in 2015. Surface modification antimicrobial coatings market generated over USD 1 billion revenue in 2015. Identification and prevention from bacteria including E. Coli along with long term adhesion and stability properties are key performance metrics will facilitate industry growth in this segment. Rising concerns associated with health problems while working in food production sites due to direct contact with untreated surfaces is encouraging factories to get antibacterial coating on the work site. Antimicrobial powder coatings market is foreseen to witness over 10% growth up to 2024. Increasing demand from medical industry, steel, furniture industry, domestic appliances and sanitation owing to rising health issues has positively influenced product demand. The product is widely used to sterilize kitchenware, refrigerators, shopping carts, food processing equipment, elevators and steel storage cabinets. Silver antimicrobial coatings market demand is expected to witness high gains and will generate over USD 2 billion revenue by 2024. Silver accounted for over 50% of the overall antimicrobial powder coatings market revenue in 2015. Possessing effective antibacterial properties to counter fungi, algae and germs are major critical successful factors. Health hazards associated with inappropriate silver quantity consumption may threat business growth. Indoor air quality applications registered over USD 600 million sales in 2015. Schools, hospitals and other institutional buildings are regulated by strict building codes particularly in the U.S. and EU to minimize the infection risk. This scenario will open new avenues for existing buildings as well as for upcoming construction projects. Medical antimicrobial coatings market will observe over 9% growth up to 2024. The product is used on medical equipment with an aim to get prevention from harmful bacteria growth and keep the devices safe and germ free. Electronics and catheters are being mainly sterilized. Increasing number of hospitals along with rising consumer awareness will be key influencing factor. Mold remediation application is set to witness significant gains and generate over USD 1 billion business by 2024. Stringent regulations are imposed to curb VOC usage in traditional antimicrobial coatings, as inappropriate consumption of VOC may cause cancer. Rising innovative ways to satisfy both conditions and material including copper will drive the demand in the forecast period. North America, led by the U.S. antimicrobial coatings market will witness growth over 10% from 2016 to 2024. Increasing healthcare spending, stringent sanitation regulations along with increasing emphasis on minimizing infections will drive the regional industry growth. APAC led by China and India will witness gains at over 9% by 2024. Rising construction, medical and food & beverages industry expansion, owing to increasing consumer affordability will open new avenues for regional industry growth. Europe antimicrobial coatings market will generate over USD 1 billion business by 2024, owing to the food retail industry expansion particularly in the UK, France, Germany and Italy. Indoor air quality and medical industry will be the key revenue generating segments. LATAM, led by Brazil antimicrobial coatings market will generate over USD 70 million revenue by 2023 in mold remediation applications. Global antimicrobial coatings market share is moderately concentrated with four key companies accounted for approximately 30% of the total demand in 2015. Presence of the numerous small scale regional suppliers and manufacturers has increased the industry competition for MNCs. BASF, AzkoNobel, DSM, DuPont and Dow Microbial Control are some of the key industry participants. Product development and innovations are important strategies. Distribution channel includes convenience stores, retailers, supermarkets, company owned retail outlets and online marketing. Some companies are focusing to obtain large presence across value chain by engaging into agreements with domestic suppliers for efficient supply. Other prominent participants are Sherwin-Williams, Diamond Vogel Paints, Arch Lonza, Nippon Paint, RPM, AK, Sono-Tek Corporation and Troy Corporation. Antimicrobial is an agent that kills microorganisms and hinders its growth, which is used as coating on medical devices for sterilization to get prevention from hospital acquired infections(HAI). It can be used in two ways self-cleaning coating and additives. Instead of doping a surface directly, additives can be used containing agents which impart antimicrobial activity. AgION developed by AK Coatings Inc is based on silver as an active ingredient. Carbon and flat rolled stainless steels are some of the products coated with AgION antimicrobial compound. It also supplies the compound for various medical applications ranging from countertops to catheters. Dow Chemical Company developed a novel BIOBANTM 200 which is paint film fungicide with low VOC amount. The paint film offers protection against attack from mildew and molds as well as biocidal activity against algae and bacteria. The company also expanded their antimicrobial arsenal portfolio with low VOC formula for constructional coatings to counter rising demand for low VOC products.